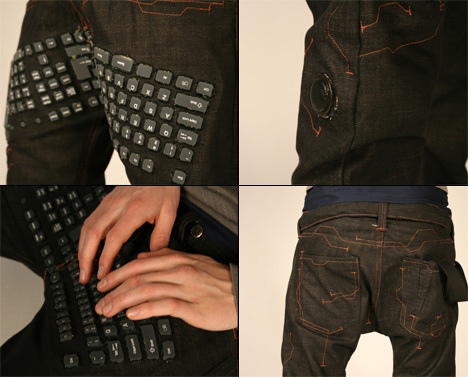 Designer Erik De Nijs, has stitched together this eye catching pair of Ã¢â‚¬Å“Beauty and the GeekÃ¢â‚¬Â jeans. These Ã¢â‚¬Å“modern shaped trousers which are often worn by youngsters..Ã¢â‚¬Â are the perfect solution for Googling quick exits while running from the fashion police. 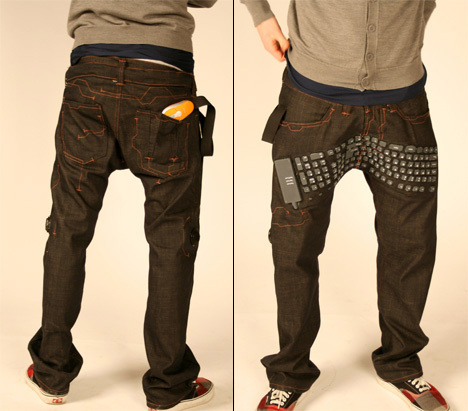 Built into the knees are a pair of crotch rocking speakers, around the back you have the added convenience of a back pocket for your Ã¢â‚¬Å“mouseÃ¢â‚¬Â, and for you gamers, there is a joystick controller located just behind the front zipper. As usual, there are additional pics after the jump. Testicular cancer, here I come! cute, is the boy included? where can you buy these? google has failed. I’m a big enough loser to want to buy them, as long as they weren’t over priced.